As a reminder, this post is about protecting sleep during milestones. This implies that your child is already sleep trained, or at least well on their way to being sleep trained. Much of the advice will not apply if you are still helping your child fall asleep for naps, bedtime, and/or throughout the night. Babies usually progress through their milestones in the following order: rolling, sitting, rocking on knees/crawling, standing, and walking. I’ll go through each one of these and how to deal, but you’ll start to see I sound like a broken record. Ahhh, the one that started it all. I remember when my son first started rolling in his crib, I’d try to “pin” him down by securing a blanket tightly around his body and tucking it into the sides of his crib (this is before I was more conscientious about sleep safety). That bought me, oh, about 18 hours of no rolling, then he broke through it. Since most parents start their babies sleeping on their backs (AS THEY ALWAYS SHOULD), this means baby is rolling from back to stomach. I always advise my clients to chat with their pediatricians on what to do when baby starts rolling. Almost all pediatricians seem to suggest that if your child flips on their own, you’re okay to leave them that way to sleep but you’ll want to follow exactly what your doctor says to do for your baby. A few peds will suggest rolling them back to their backs until a certain age…and that often causes a jack-in-the-box effect; you roll baby, baby rolls back, and on and on for hours. Yet, if that’s what the doctor advises, that’s what you should do. If you’re concerned about stomach sleeping, as I was, there are now several products on the market, including the Hi Sense Baby Monitor, the Snuza, and the Owlet that claim to monitor your baby’s chest movements or breathing while they sleep. These haven’t been proven or approved by the FDA to work, but you may choose to use one anyway. One thing I would suggest all new parents remember is that your baby is not the first baby in the history of the world to roll! In my opinion, it is rarely, if ever, a wise choice to physically restrict your child from moving the way they’d like to in the crib. If you find your child is rolling and is very unhappy about it, I would recommend employing whatever sleep training method you used the first time you helped your child learn to fall asleep on their own. You can check-in, you can cry-it-out, or anything in between, but my recommendation is to, with the pediatrician’s consent, leave them be and let them sleep on their stomachs. As an aside, I find that children tend to sleep more soundly once they’ve learned to roll and flip – the more freedom they have to move (around the 4 month mark and beyond), the happier they are. Do you like being stuck sleeping in just one position all night? I also vividly remember the first time I caught my daughter sitting in her crib! I didn’t own a video monitor (ah to be poor and married while your husband attends law school) so it was quite a shock to walk in and see a sitting child where I’d left a prone one! These milestones really trip parents up because they feel they need to “knock” their littles one over in order to try to compel them to go to sleep. Often with sitting, babies don’t cry, they just don’t sleep. They either take forever to fall asleep because they get stuck sitting up, or they end their nap early and just sit around, haha. What you want to keep in mind is that the crib is often your child’s only place to truly be free! They will love to practice all their skills there. So, my advice is the same as above, and especially if your child does not seem sad or upset about their state, it’s better to just leave them be. Set a minimum amount of time for their nap, usually 60-90 minutes, and allow them to stay in their crib for that amount of time, even if they wake early. If you find that sitting/rocking/crawling keeps them awake, give them about the same amount of time to fall to sleep for a nap, then retry your nap again later. The less you interfere, the faster they’ll “get it”. Also, try to teach/show them how to fall over/lay down during their waking hours. It may just help them figure out how to get out of the sitting position in their crib. Babies will often want to “try out” a new skill over and over and over again over a 3-5 day window, then sort of be “over it” once they’ve mastered it…all the more reason to stay out of their way. 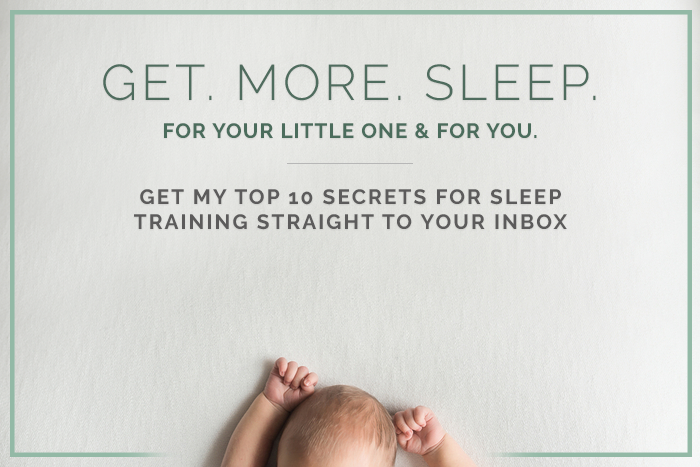 The faster they master the skill, the faster they’ll get back to lengthier sleep periods. Next to rolling, I think standing is the hardest milestone for parents to deal with. This is because most babies legitimately get stuck in the standing position and can’t figure out how to get down. But, guess what happens when Mom comes in to lay the standing baby down? That’s right, just like that jack-in-the-box that baby jumps right back up again! I would also suggest standing your baby in their crib and showing them how to slide down. Again, like all of these milestones, if you just keep out of it to the extent possible and do not help your baby fall back to sleep, it will pass within just a few days. It’s only when you start to introduce new sleep associations that you run into problems. If your pediatrician says it’s okay, leave your child be and allow them to learn how to sit back down on their own. I don’t consider this a milestone, but it is a physical issue that seems to frustrate a lot of parents. My clients are often asking if they can/should “reposition” their baby if they appear to scrunched up in the corner of the crib or if they simply otherwise appear to be in what looks like an uncomfortable position. 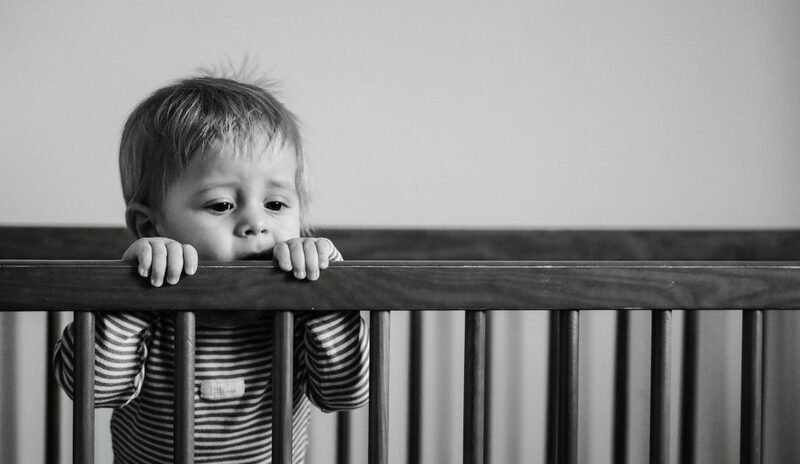 If you don’t have anything in your child’s crib, you shouldn’t necessarily need to reposition your baby, as long as you’re able to verify that they’re breathing. If they appear unsafe in anyway, reposition them immediately. Again, this is a question that should first be asked to your pediatrician. Another caution to keep in mind is breathable bumpers. These are popular with my clients as well, but I have personally witnessed a small 5 month old flip to his side, then belly, then scrunch up to the crib and shove his face on the *only* piece of solid fabric on the whole breathable bumper. The only things in the crib should be mattress, the fitted sheet, and the baby, nothing more. Thanks for reading! Please remember to follow me on Instagram and be sure to share, comment, and like this post! !